Surmang Khenpo working via skype with the Nalanda Translation Committee. For much of this year we have been focused on preparing a number of Gesar liturgies and sadhanas for the upcoming Wrathful Gesar abhisheka and teachings in November withNamkha Drimed Rinpoche in Halifax. 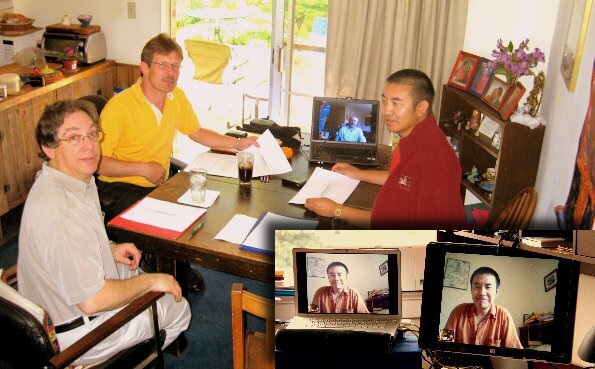 We reviewed our translations via Skype video conference with Surmang Khenpo, who has been living in Boulder all year. 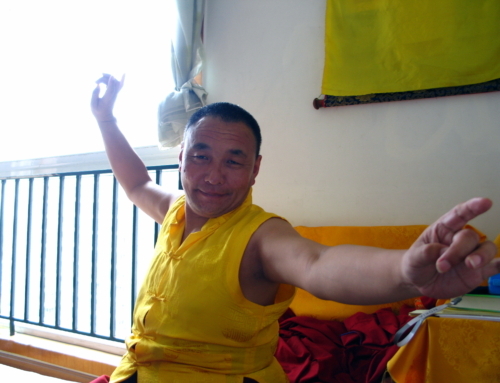 As always, Khenpo was extremely helpful, and our video sessions were often lively and fun. More information on these texts will be included in our next newsletter. During his visit to Halifax last November, we had the good fortune to meet with Dzongsar Khyentse Rinpoche on a peaceful Gesar Dorje Tsegyal sadhana by Mipham Rinpoche. 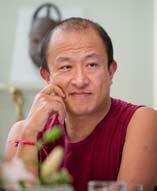 For our remaining questions he pointed us in the direction of Orgyen Tobgyal Rinpoche in India. A slide show of the meeting by Marvin Moore, with a short audio morsel, can be seen and heard on the NTC page of The Chronicles of Chögyam Trungpa Rinpoche website:www.chronicleproject.com/ntc_2.html. Talu, Jessie, Larry, and Scott at Deer Park in Bir. Following the “Translating the Words of the Buddha” conference held in Bir in March, Larry and Scott traveled by bus with the rest of the conference group to see the Dalai Lama in Dharmasala. While there, they ran into Jessie Litven and she traveled back with them by bus to Bir. After arriving in Bir in the evening, they learned that Orgyen Tobgyal Rinpoche could meet with them that evening.They ran to his house—at the pace set by aging translators, it took twenty minutes—and ended up having a two-hour meeting with him on the Dorje Tsegyal sadhana, which is one of the Gesar texts the Sakyong requested us to translate. He knew the answers to every question and was very definitive. In May, we were able to continue our review of a portion of the Gesar material with Khenpo Gawang during his teaching visit to Halifax. Every time we see him, we notice that Khenpo Gawang’s English skills have improved, and we look forward to seeking out his knowledgeable advice, delivered with his signature gentle confidence and humor. In Halifax, we were able to meet with Namkha Drimed Rinpoche to ask some of the more difficult questions on the Gesar material while he was here in August, as well as meet with his son Gyetrul Jigme Rinpoche during his visit in September. In preparation for Sakyong Mipham Rinpoche’s first Vajrakilaya abhisheka in October, we have been preparing a translation of the empowerment text so that it can be given in both Tibetan and English. We were able to review this text with Surmang Khenpo and Changling Rinpoche. Patricia particularly enjoyed this as a section of it was the first selection she ever translated when she began to work with us seven years ago. We will also publish a new edition of the Vajrakilaya Practice Manual in time for the abhisheka. In anticipation of this summer’s visit with Changling Rinpoche, we published a revised edition of Naturally Liberating Whatever You Meet, his teachings from last spring on Khenpo Gangshar’s text of that title, which includes an additional talk on vajrayana practice. In Halifax, we had great fun being quizzed by Changling Rinpoche on various dharma points—he asked us just about as many questions as we asked him—and thenewer members enjoyed hearing Scott, Larry, and Mark’s explanations of the Vidyadhara’s reasons for various translation terms, such as rikpa (the Vidyadhara preferred “insight” to “awareness”) and dikpa (the Vidyadhara thought “evil deeds” had a good level of weightiness, while “sin” was too religiously loaded, and he originally liked “neurotic crimes”). Changling Rinpoche solicited these excitedly, since his interest in the nuances of English is extraordinary. Most of the Committee continued with him on his tour to Dorje Denma Ling to have some extra translation and study time with him. We look forward to his return next year. At the end of 2008, we completed our translation of the main longevity supplication for Sakyong Mipham Rinpoche, composed by Namkha Drimed Rinpoche. This was published in an elegant two-color edition to match the Daily Chant Book, where it will eventually be included, and a simpler version is available for downloading from our website. We also finished our work on “The Melody That Accomplishes Deathlessness” by Mipham, which is a general longevity supplication for all teachers, now available in print and online in PDF. For the first time since the original 1976 typescript translation, we reprinted The Sun of Wisdom, the guru-yoga sadhana and feast offering, written by the Vidyadhara for his root guru, Jamgön Kongtrül of Shechen. The booklet includes practice instructions, chöpön procedures, and new torma drawings by Tom Crow. This fall, this will be featured on the NTC page of the Chronicles of Chögyam Trungpa Rinpoche, along with more of his teachings concerning his root guru at: www.chronicleproject.com. We made a few important revisions to the instructions for using the Vidyadhara’s Sadhana of Mahamudra as a funeral liturgy, and these are published in a new edition of our literal translation of that text, with amendments found on our website. 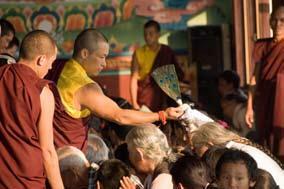 We published a revised edition of Mingyur Rinpoche’s Three Words That Strike the Vital Point. For future Söpa Chöling retreats and occasional other requests, we revised ourKönchok Chidü Practice Manual, which includes practice commentaries written by Jamgöön Kongtrül Lodrö Thaye. The revised manual includes torma and music illustrations for the first time. We made overall editorial suggestions and checked the Tibetan and Sanskrit for the forthcoming first volume (hinayana) of the “Root Texts Project,” a compilation of theVidyadhara’s teachings from 13 three-yana seminaries, edited by Judith Lief, entitledHinayana: The Path of Self-Reliance. We are also translating the Vidyadhara’s notecards for his talks at the Seminaries, which will be helpful to the editors and readers of the future mahayana and vajrayana volumes; and will also be included in a Seminary Transcripts DVD. 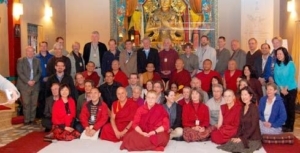 Larry participated in both translation conferences and led a ten-day Chakrasamvara retreat at Dojre Denma Ling last winter. Scott led a mahamudra retreat over the Christmas holidays at the Shambhala Centre in Halifax (another is scheduled for this coming December). He guides the translation efforts of an ongoing Tibetan class in Halifax; this past year the class translated some pieces from the Vidyadhara’s collected works and also worked on sections from a “Werma Nyingtik” terma, with Gesar as the main yidam, which was discovered by Dilgo Khyentse Rinpoche at Surmang when he was there with the Vidyadhara long ago. 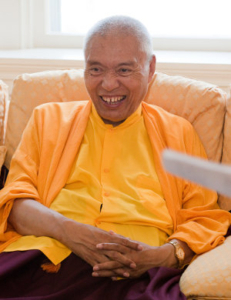 In the spring, he taught a class in Halifax on valid cognition from Khenpo Tsultrim Gyamtso Rinpoche’s Lorik text, and over the summer he taught Lorik, Uttaratantra, and Tibetan at Nitartha Institute. Mark taught a Vajrayogini course for new sadhakas here in Halifax, and continues to lead fire offerings at Dorje Denma Ling, particularly weekend ones focusing on enriching or magnetizing. In addition to attending and blogging about the Rinchen Terdzo empowerment this winter, Walker led a one-week Shambhala ngöndro program at Dechen Chöling this August. He also released a second CD of dharma-inspired songs entitled Body of Lightlast fall (available at www.highlandeyes.com). 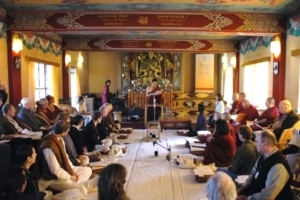 From early December 2008 through mid-March 2009, members Walker Blaine andPatricia Kirigin attended the three-month series of empowerment rituals known as the Rinchen Terdzö, or “Precious Treasury of Termas” held at Rigön Thubten Mindrölling Monastery in Orissa, India. This series of roughly nine hundred separate empowerments was collected and compiled in the 19th century by Jamgön Kongtrül Lodrö Thaye over thirty-three years, with the aim of preserving each terma’s lineage for future generations. His student, the 15th Karmapa, Khakhyab Dorje, later spent eight years creating a comprehensive order and outline for the texts, which itself comprised 2,500 pages in four volumes. The empowerments were bestowed by Namkha Drimed Rinpoche, who received the transmission directly from the Vidyadhara before he left Tibet. Sakyong Mipham Rinpoche was the principle recipient and was empowered to hold and continue the transmission lineage at the conclusion of the event. 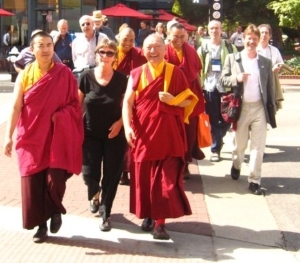 At the request of the Sakyong, Walker maintained a daily blog chronicling the event, while Patricia provided the Sakyong and Western students with a daily English translation of the titles of the empowerments being given. Their work can be seen at: www.rinchenterdzo.org. In the fall of 2008, Jessie Litven left Halifax to finish her work on Lady Könchok Paldrön’s biography in Boulder, also attending the “Conference of Translators.” Traveling east, she translated and taught beginner’s Tibetan at Mingyur Rinpoche’s Tergar Institute in Bodhgaya, India. Though she had briefly interpreted for Mingyur Rinpoche’s Khenpo Kunga last year, this was her first time translating on a daily basis in front of a larger audience. 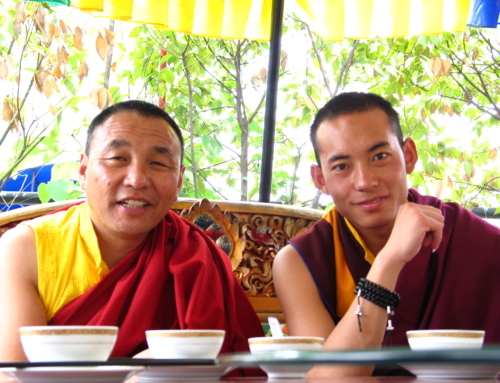 As Mingyur Rinpoche is very keen on bringing his own khenpos up to speed with the ways of West, he also requested that his own teachings given in English, both mahayana and vajrayana, be translated into Tibetan over short-wave radio. This led to many interesting discoveries in both languages as well as many humorous moments (How do you say, “You rock!” in Tibetan?). Jessie also made her formal teaching debut, leading a group of eager new students through the basics of the Tibetan language. 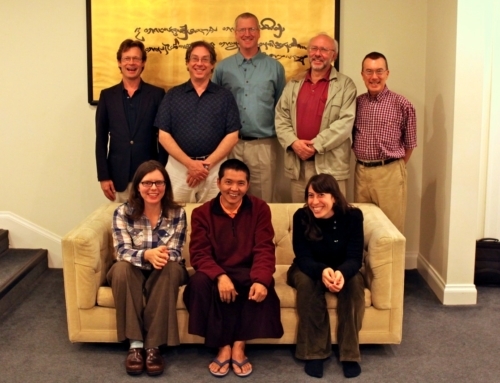 There is a simple website created for the materials of this class for participants or anyone interested in Tibetan language at: www.beezwings.org/tibetanclass. She continues to work on Namkha Drimed Rinpoche’s Gesar terma, and will be returning to Halifax in September. Last fall, Light of Berotsana hosted the “Conference of Translators.” For the first time formally, and decades overdue, translators of Tibetan Buddhism from all over the world, representing Kagyu, Geluk, Sakya, and Nyingma traditions, came together at the Boulder Shambhala Center to discuss issues concerning Tibetan-to-English translation. Among them were NTC members from Halifax—Larry, Mark, and Jessie— as well as NTC members Ann Helm, Derek Kolleeny, Jules Levinson, Phil Stanley, Clarke Warren, and Gerry Wiener. For many, it was an extraordinary chance to reconnect both socially and productively with dear friends from the past. For some it was a swift welcome into the bigger picture of translation, especially since most Tibetan translators work individually without the support of a larger network. We had the very auspicious opportunity to meet special guests such as Zenkar Rinpoche, Tulku Thondup, Dzigar Kongtrul Rinpoche, Ringu Tulku, Surmang Khenpo, and Lama Chönam, as well as pioneers Jeffery Hopkins and Alexander Berzin, who either gave prepared talks or simply shared their insights in the context of roundtable discussions and informal lunches. Aspiring translators, mostly from Naropa University, were also invited to listen in. Though it was designed around specific topics—ranging from balancing precision with literary values to deliberations on key Tibetan terms to the latest tech developments in Tibetan digital libraries—overall the conference served as an opportunity to network about the future vision of translation and the possible formation of a translator’s guild. More information and videos can be found at: berotsana.blogspot.com. 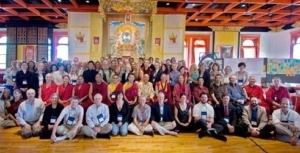 A historic conference, organized and hosted by Dzongsar Khyentse Rinpoche and the Khyentse Foundation, and chaired by Dzogchen Ponlop Rinpoche, was convened at Deer Park Institute in Bir, India, this March. The conference featured many of the rinpoches and lamas who have been spearheading the efforts, as translators themselves and as sources of knowledge for translators, to transplant the dharma into English and Western culture generally. There were teachers and translators representing all four of the major Tibetan lineages, including Dzigar Kongtrul Rinpoche, Orgyen Tobgyal Rinpoche, Pema Wangyal Rinpoche, Jigme Khyentse Rinpoche, Doboom Tulku Rinpoche, Khenpo Kalsang Gyaltsen. The Nalanda Translation Committee was well represented at the Bir conference, with Derek Kolleeny, Jules Levinson, and Phil Stanley joining Halifax-members Larry Mermelstein and Scott Wellenbach. The Vidyadhara’s emphasis on group work and use of Sanskrit were interesting counterpoints to what has become the usual way most translators work these days. The vision of the conference was could not have been larger: to translate and make accessible the entire Buddhist literary heritage. More practically, the twenty-five year goal is to translate into English the Kanjur (words of the Buddha) and its associated commentaries from both India and Tibet. The five-year goal is to set in place the structures that will allow us to accomplish the longer-range goals and to make significant progress in translating representative texts in all areas. Where the vision is vast, earth must meet heaven. One important focus of this conference was the translation of the Kanjur. The issues involved in this work are daunting: multiple editions of the Tibetan texts need to be taken into account, often with significantly different readings due to over-eager or politically and religously motivated editors. Work on tracing the historical lines of these various editions and creating critical editions has just begun. As well, within the Kanjur, the translation of the sutras entails profound issues of interpretation. Unlike the Chinese and Theravadin traditions, the Tibetan custom was to treat the sutras as objects of veneration and worship, but not to study them. They were ritually chanted, but were not to be found, other than certain famously quoted passages, in the Tibetan study curriculums. Consequently, as was frankly acknowledged by the learned Tibetan masters at Bir, it is the rare Tibetan (indeed, if there are even any alive today) who would feel confident in their understanding of these texts and could serve as resources for translators.